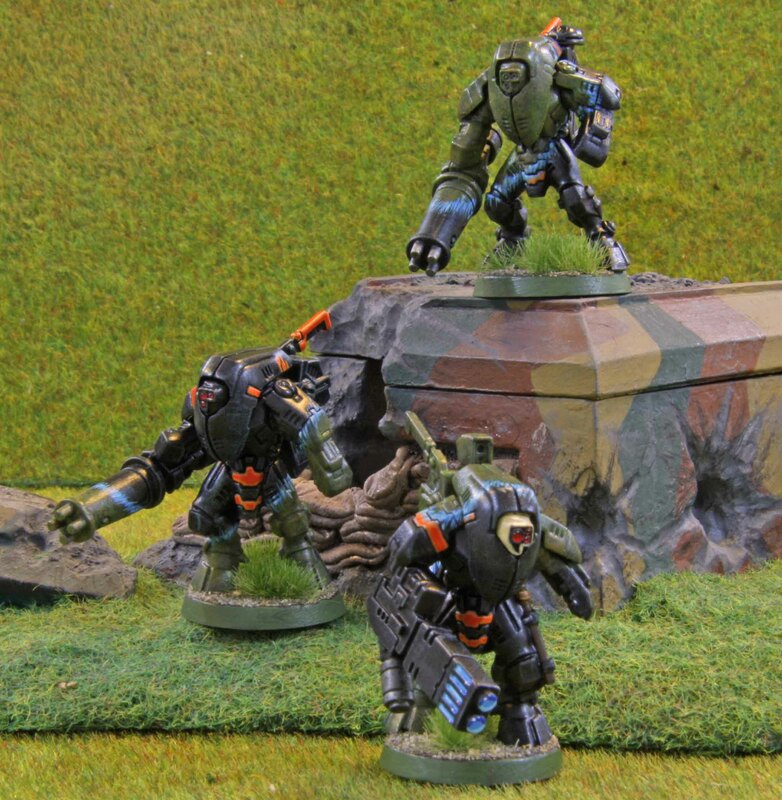 After having completed another large unit for my Napoleonic Prussians (I will post pictures of those tomorrow) I treated myself to another small unit for the Tau Cadre I am working on. This time it is Stealth suits. Now the fluff says that the stealth suits have stealth field generators that virtually turn them invisible like a cloaking device on Star Trek. Somewhere on the internet on the internet I saw pictures where someone had painted his to make them look like they were in the process of de-cloaking and I wanted to copy that. 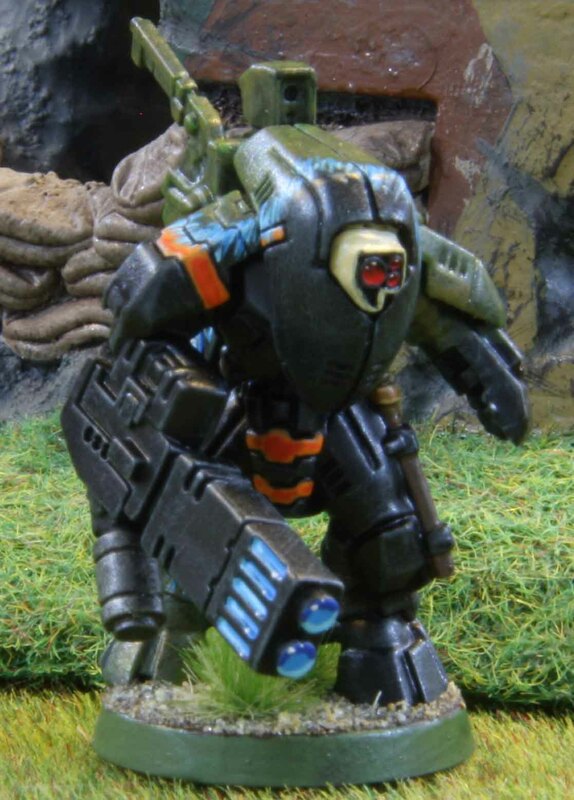 So part of the suit is in their regular black paint job look with orange Sept markings, while another part still shows the mottled greens from the environment projected by the stealth field. both parts are separated by a blue ripple to where everything is de-cloaking. Hope the effect turned out fine! 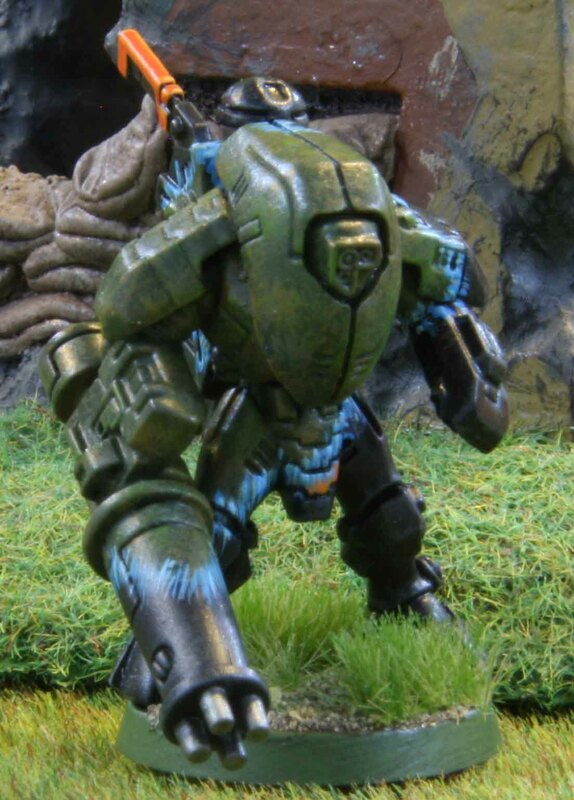 I know the fluff says that if the sensor vanes are painted in Sept colors, the model is a Shas´ui. 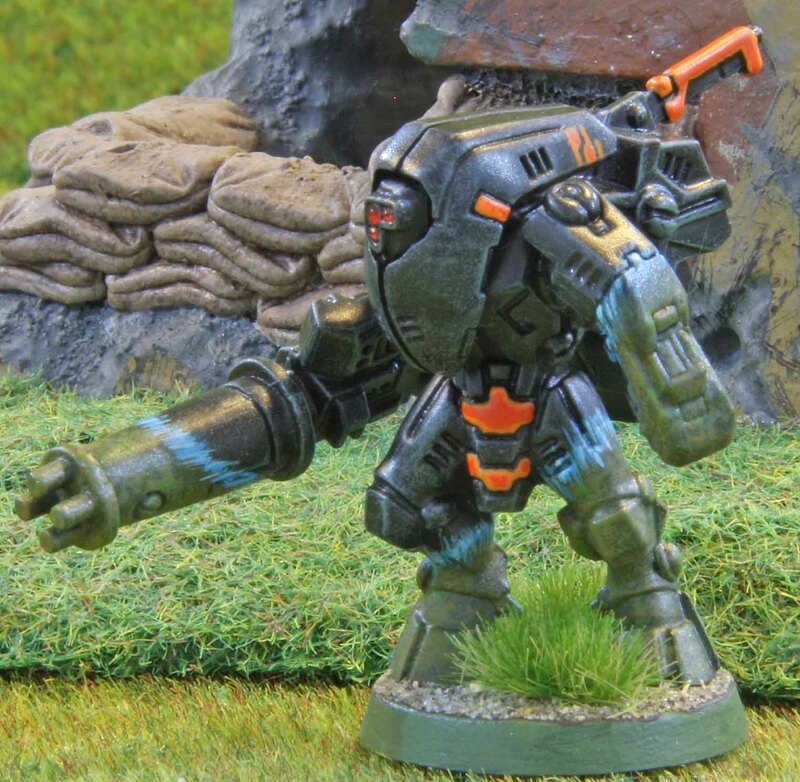 But I simply liked the looks of the sensor vanes painted in orange in the new codex, so the whole of the team got them, along with some more orange over the suit to show their allegiance. After all I already said that my NCO´s and Officers are going to be marked by parts of their uniform or suit being picked up in tan (or a flame pattern) instead… so I am sticking with that! So with the exception of a few SAGA minis and a lone Samurai all I painted this past year was Napoleonics. Given the fact that I made very good progress this year, I decided to treat myself to a short diversion. Now some of you might remember that I gave you the choice to decide what I would paint over the Christmas period… either Byzantines for SAGA or Tau for Warhammer. The poll went in favour of the Byzantines and so they were painted. None the less I still want to get the Tau painted this year, so I felt they would be good for a break and so I painted my three Firewarrior teams up. Two of them were bought used off eBay. I knew they could be counted as primed at best when I bought them, but had I known how poor some people seem to be at removing flesh or at using less than half a bucket of glue per mini, I would rather have bought them new for more. Anyway, after a lot dismantling and cleaning they were fit for a paint job. As some might remember from my musing last year. I did not want these to get the average orange tan colour that most Tau seem to be painted, but rather want to give them a woodlands look. Now these are my basic grunts so I chose a very simple uniform for them to signal just that. So it was black overalls (highlighted dark grey) and olive-green body armour for them. Quiet simple and still effective camo. The optics, both on their helmets and weapons as well as the markerlights were painted in red with reflections, the lenses on their lasers as well as the energy cells on the same and the grenades in blue.The weapons were painted in a very dark gun-metal grey (housemix). The first team, the one armed with Carbines, is the largest at twelve men, while the two armed with rifles are smaller at ten. I would have prefered to arm them all with rifles, but there are not enough in a box to arm them all that way (and my eBay purchases contained a mix as well) so I had to do with some carbines. Since these will be closest to the enemy and shall therefore most likely take the most punishment (= losses) I felt they should also be the strongest. The biggest gripes I had with these minis is that there were not enough heads with helmets. I felt that bare heads did not make too much sense. The helmets clearly contain some good optics, so why deprive yourself of that? Also they are most likely to provide protection against fire and toxins, so again why go without? In the end I bought some separate helmets from eBay in the US and equipped them all with helmets. Same will go for the tankers when I get around to those! Now I decided to have a squad leader and a deputy. In modern military terms a Sergeant and a Corporal. The Warhammer Universe does not seem to know such a redundancy in the chain of command, But I wanted it anyway. My initial idea had been for the Sergeants to have the complete shoulder armour and helmet in a tan colour and the Corporals only partially in tan, to set them apart. For the Corporals I stuck with this, although I broke with my idea to do them all the same. Now one of them has just edged his helmet, the other has partially edged his helmet in more fluid form while the third just has lines running over the helmet. Now when I started with the Sergeants, I did not like the looks. And I wanted something even more special. Since these troops are called Firewarriors I went for a fire pattern to their helmets and shoulder armour. I left the rest of the armour in green to show that they had adorned their standard issue armour with flames after rising through the ranks. Their national colours were painted in the same firy colours as well, while the rest of the unit had them in subdued in tan. I retrospect I liked them a lot and am a bit sorry that I did not go for flaming armour instead of green on all minis. But I was in no mood to repaint them all. After all this was only going to be a quick and basic paint job after all. 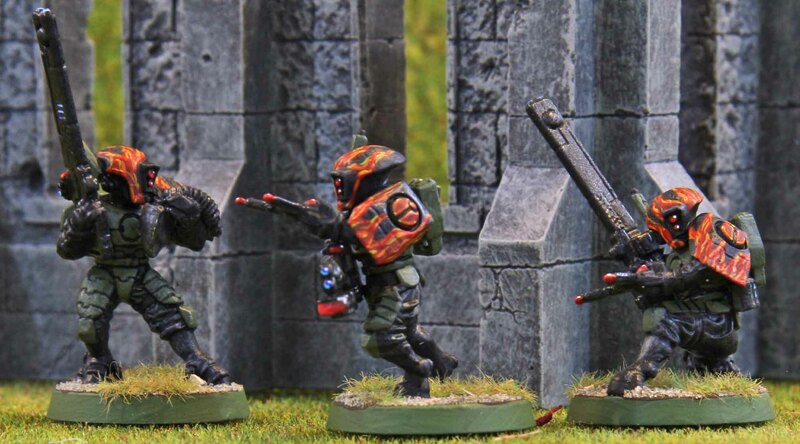 Coincidently I have seen that GW announced an overhaul to the Tau just today and that this also includes a veteran Firewarrior wearing different armour. I guess I will get myself one of those minis and paint him completely in a flame pattern.